When I first started this blog, I was planning a trip to New Orleans for Gabe's 30th birthday. I thought I would write about the money I save while living in a new city and traveling the country. I buy pretty much everything in advance and always look for deals. When it is time to travel, I stalk Living Social, Groupon and then use Yelp to make sure the places offered are somewhere I would want to visit. I feel I owe some love to New Orleans. It was that trip that started these little fingers typing again. It's also the city where Gabe and I have an equal fondness for. If we were to plan a destination wedding, it would be here. So it was natural to plan our second annual trip to NOLA for his graduation trip. Due to the fact he graduated with his masters in December, the holiday's postponed our trip a bit. Especially since we wanted to take it with both sets of our parents. We pushed the trip back a few months and we couldn't be any happier. Our February trip has allowed us to run the Rock n Roll Half Marathon New Orleans! Once we were signed up for the race, it was time put my OCD travel hat on. When traveling, I am a control freak who drafts up an excel sheet so I know what to wear on each day. If only my day to day life was this organized. 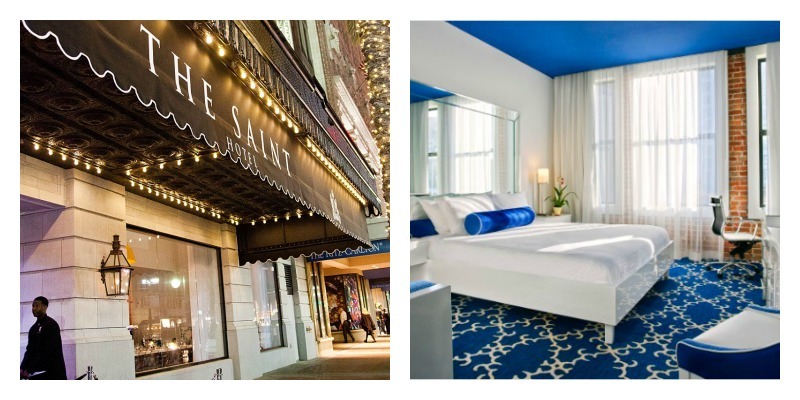 Last year, we scored big with a 4 star hotel for only $85 a night thanks to Captain Kirk Priceline. Hitting accept and waiting for the Negotiator to approve or deny my bid is exciting and completely nerve racking. The 4 star $85 bid in 2012 granted us a stay at the French Quarter Marriott. It was an amazing centrally located hotel at an incredible price. We stayed during the week, arriving on a Tuesday morning, leaving on a Friday night. Fast forward to 2013. I decided I would bid the same amount and same stars, just to see what would happen. My motto on life is what's the worst they can say, no? Never in my wildest imagination would I have thought the words Congratulations, your deal is in the bag would appear on my screen. Yet it did, The Saint New Orleans, a 4 star hotel for $85 a night, Wednesday through Sunday. 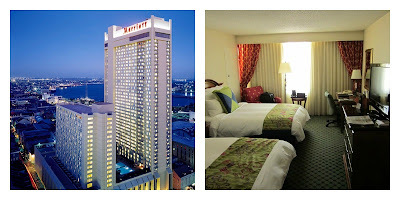 I quickly went to the hotel's website to learn that they are a Marriott signature collection in a historical building. In a matter of seconds, my parents went on to negotiate the same room, only to be denied, even at a much higher price a day later. I guess the negotiator was on our side that day. This room is valued anywhere from $300-$400 a night. During our trip last year, we utilized Living Social and Groupon for all of our tours. I am running into the problem that everything we did in 2012 happens to be the same offers available a year later on these sites. So with the help of google, I have found a few free New Orleans tours?! You pay a tip, which one would generally do on a paid tour. We have signed up for the ghost tour and are looking at the Garden District tour. One thing I really want to do is the New Orleans Original Drinking Tour (shocker). I sent this to my parents, to receive a quick response from my Mom "have fun, I will puke if I do that". She doesn't realize that she would fit in on Bourbon Street nice if that were to happened. Another tour in contention is the jogging tour. If you have never made a trip to the big easy, I strongly suggest it. There is something magical about this city. The history, the architecture, the amazing culinary offerings and the dirtiness of Bourbon Street all make up for a perfect city to visit. There is truly something for everyone here. 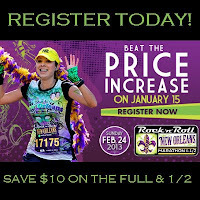 Save $10 on the Rock n Roll Half Marathon New Orleans with Coupon Code ROCKNOLA2. Hurry, prices increase on 1/15. Do you plan like a crazy person prior to go on a trip or do you prefer to wing it? Sometimes I wish I could go with the flow and I think this is why I like going on cruises, everything is planned out for me so I don't stress out. I love to plan trips, but sometimes just winging it is fun, too. I haven't tried Priceline but have heard great stories! I'm just so scared of getting a bust. Hey, I have some Rock n Roll half ladies fitted shirts - do you want one for St. Pete? Let me know and I will get it to you! Priceline is awesome (Sometimes frustrating). But I have never been burned by them. They are very good about sectioning off the areas you are traveling to. So you know what area of town you will be in. Name the star, the price and hope you get accepted! I need to get better at winging the trips. The bike tour is unbelievable as well - it takes you all over the city and into pats you don't normally go! I highly suggest it! GOOD to know! We saw that one last night. They also have a drinking bike tour..hmm....may not be the best option for Miss clumsy over here!